AmScope M100C-LED is the most cost effective yet high quality biological microscope for young scientists and scientific enthusiastic age eight and up. 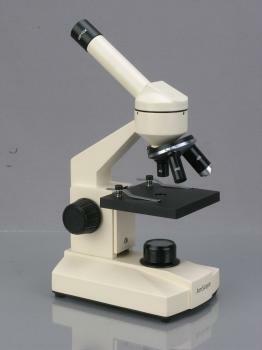 It is ideal for viewing cell tissues, bacteria, and fungi in both self-prepared slides and pre-made-slides, such as onion cells, leaf cells, cheese bacteria, etc. It makes the microscopic world within the reach to everyone. AmScope M100C-LED comes with all glass optical elements and solid metal body. 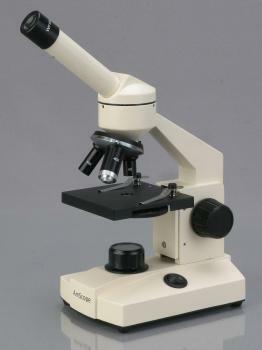 The microscope provides sharp clear images and will last long enough to cover all the way from elementary to high school. The sturdy metal construct offers stable images at high magnification levels instead of shaking ones. The build-in battery slot uses three AA batteries to power the microscope on-the-go, and an 110V-4.5V transformer can be plugged in when using indoor setting. AmScope M100C-LED features five levels of magnification settings that produce crystal clear image without any frustrations. Glass achromatic objectives minimizes aberration and last longer. A great portable LED microscope! Monocular microscope body with LED illumination, Objectives: 4X, 10X and 40X, 10X eyepiece, 25X Eyepiece, Dust cover, Clips (pair), 110V/60Hz DC 5V adapter. Be the first to review “AmScope Optical Glass Lens All-Metal LED Compound Microscope, 6 Settings 40x-1000x, Portable AC or Battery Power” Click here to cancel reply.